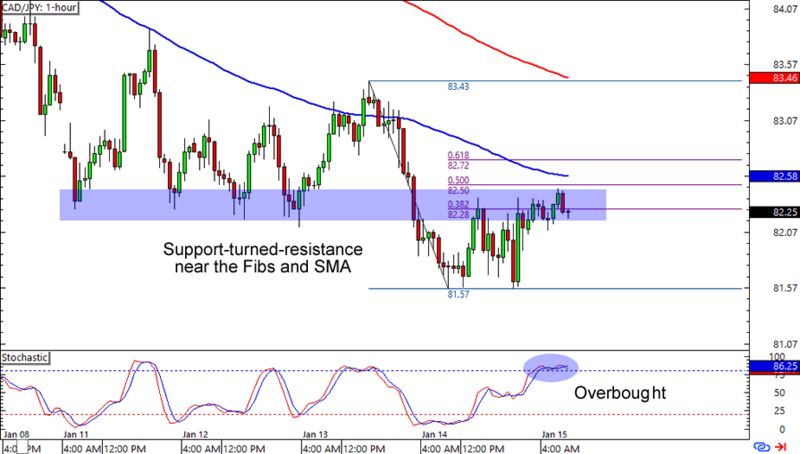 After hitting support around the 81.50 area, CAD/JPY has pulled back and is encountering resistance at the 82.25 zone. This isn’t exactly surprising, since it’s right smack at a previous support, 38.2% Fib retracement level, and 100 SMA roadblocks. Talk about being locked in tight! The cherry on top of the bears’ sundae is Stochastic’s overbought signal. Think the Loonie will see more losses against the yen? 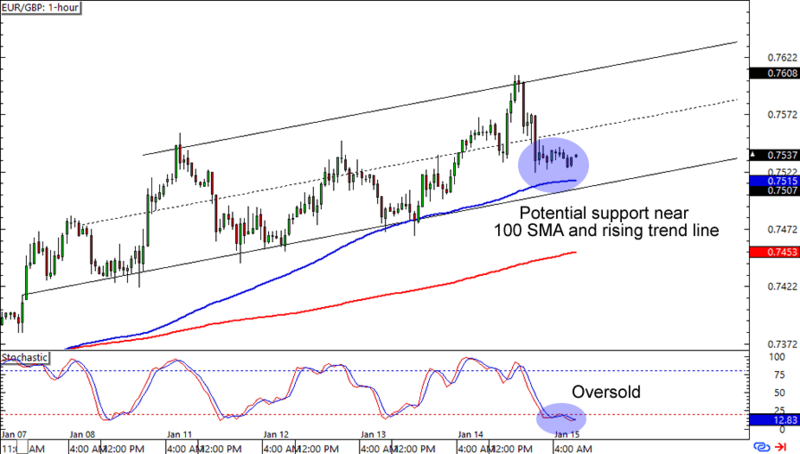 A short trade with stops above the SMA could get you decent pips if you believe that CAD/JPY is set to make new lows. On the other hand, you could also wait for a break above the SMAs on the 1-hour time frame if you’re one of the Loonie bulls. Here’s another trend trade for ya! EUR/GBP is lollygagging around the .7525 area, which is near a rising channel support and 100 SMA on the 1-hour time frame. Not only that, but Stochastic is also on the bulls’ side with an oversold signal. Be careful with buying at current levels, though. The pair could still hit the .7500 mark before making any decent bounce. In any case, read up on finding entries with retracements if you haven’t tried trading trends! Remember that Fib opportunity we’ve identified a couple of days back? 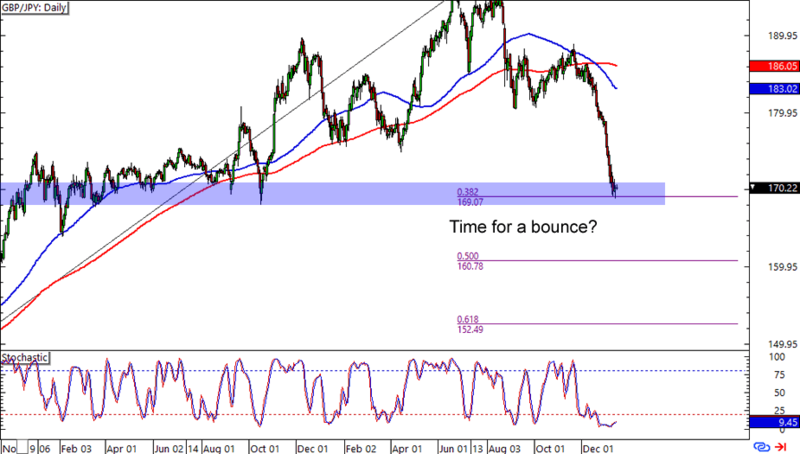 Well, it looks like GBP/JPY might be showing a bounce in the making. The pair is finding trouble breaking below the 170.25 area, which isn’t surprising since it lines up nicely with a strong area of interest back in early 2014 AND a 38.2% Fib on the daily time frame. In fact, the pair is already sporting hesitation candles. Will we see soon see Guppy bounce? Remember to place wide stops if you’re trading this one, will ya? Not only will you be trading the daily time frame, but you’ll also be trading a currency cross, which usually shows more volatility than other types of currency pairs.